Hyundai is Set to Make Noise at the World Cup! As an Official World Cup Sponsor, Hyundai is enhancing the experience of all fans attending games in South Africa with the construction of one of the nation's newest attractions. 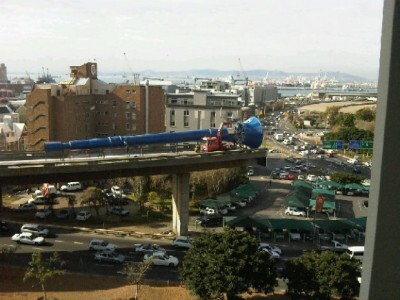 Per KeenonCapetown.com, Hyundai built and mounted a massive 35m blue vuvuzela (an air horn commonly seen at soccer matches) on an unfinished highway in Cape Town. The giant vuvuzela, which set a Guinness World Record for the largest air horn ever built, will go off every time a goal is scored during the World Cup! 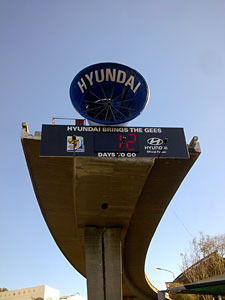 The vuvuzela was created in support of Hyundai's 'Bring the Gees' campaign. Check out the pictures of the giant vuvuzela below!